Former military members across North Carolina have banded together to create craft beer using the skills and principles learned during their service. Editor’s note: Since time of publication, Beer Army Combat Brewery changed to Beer Army Burger Company. When North Carolina troops return from military deployments, they often crave the familiar flavors we take for granted. After an extended diet of ready-to-eat meals, few things taste better than a grilled burger dressed with Duke’s, a second serving of strawberry shortcake, and an ice-cold beer. For a handful of enterprising veterans, beer has become more than a sip of freedom. It’s their livelihood, earning them opportunities to translate leadership skills gained through service to our country into the creation of quality craft brews. Since April is North Carolina Beer Month, it’s good to note that at least six breweries owned or operated by veterans have opened in North Carolina in recent years. Beer Army Combat Brewery is located in New Bern, just down the road from the Marine Corps Air Station Cherry Point. Among its award-winning beers are Fire in the Hole, an Irish-style red ale, and Heroes Never Die!! !, an American-style IPA. At The Mash House Brewing Company in Fayetteville, a double IPA recently debuted with the name Intrepid, a salute to the courageous fighters at Fort Bragg. Railhouse Brewery in Aberdeen has KA-BAR, a brown ale named for the combat knife adopted by the Marines during World War II. The brew won a gold medal at the 2013 International Craft Beer Awards. Sold across North and South Carolina, it’s also popular around Camp Mujuk in South Korea, one of the largest Marine Corps bases in the world, offering a taste of home. These military brethren caught the craft-brewing bug the same way most of the state’s top brewers did: by making small-batch beer at home. But there is more that unites them. “They all seem to agree that their military training gave them the know-how and confidence to become craft beer entrepreneurs,” says Margo Knight Metzger, executive director of the NC Craft Brewers Guild. And they all observed a lack of local breweries in friendly territory near the state’s many military bases. Several veteran-led start-ups were in discussion when Railhouse led the charge and was established in December 2010. Not far from Fort Bragg and Fayetteville and near Aberdeen, Camp Mackall Army Base is where soldiers train to become members of the elite U.S. Army Special Forces. Ratkowski says the structure and rigor of military service develops job-ready skills that are essential to success in the public sector. “None of us are afraid of getting our hands dirty,” agrees Vernardo “Tito” Simmons-Valenzuela, a former Army medic turned brewmaster at Dirtbag Ales in Hope Mills. “Everything at our brewery, except what we’ve needed commercial permits for, we’ve done ourselves. Lead-from-the-front and be-the-example definitely came into play,” he adds. Niebauer’s team calculated that the Sandhills could support two breweries. Southern Pines Brewing is located along the same rail line as Railhouse Brewery, even having used Railhouse’s equipment before acquiring its own gear. More comrades than competitors, the two recently collaborated on a black IPA called Ties That Bind. Richard Young developed his brewing skills on the West Coast before landing at Fayetteville’s The Mash House last November. Once a member of the distinguished 7th Infantry Division at California’s Fort Ord, he has fond memories of time spent training at Fort Bragg with the 82nd Airborne. 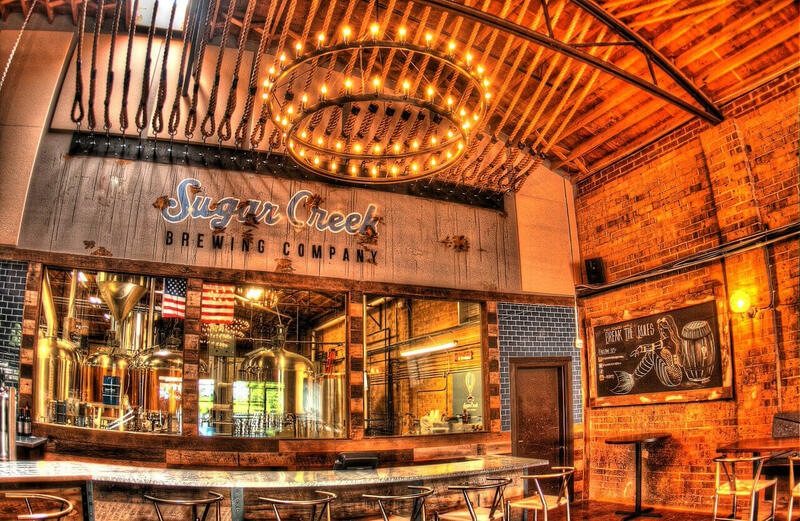 There’s little about the upscale taproom or list of classic Belgian-style ales at Charlotte’s Sugar Creek Brewing Company to suggest that it’s run by veterans. “We don’t market our military experience,” says CEO Joe Vogelbacher, a graduate of Kings Point Merchant Marine Academy and current member of the Naval Reserve. His partners include a Marine Corps infantry machine gunner who served in Iraq and Afghanistan, a Navy submarine electronics technician, and a former nuclear engineer with Newport News Shipbuilding. With a logo that depicts an American eagle with a wild-eyed Devil Dog on its chest, there is no mistaking Beer Army Combat Brewery’s pedigree. The image combines the motivational nickname for the Marines with the look of Beer Army founder and “General” Dustin Canestorp’s beloved late Doberman. He says it’s a constant reminder that making and selling beer is a means to doing good in his community. Application information will be posted on the foundation’s website, BeerArmy.org. Military branding also plays a big role at another veteran-owned and operated brewery. Being called a “dirtbag” might not strike you as a compliment, but Simmons-Valenzuela says fans of Dirtbag Ales recognize the intended fellowship. “We call people dirtbags when they’ve kicked around” various deployments, explains Simmons-Valenzuela, who met his business partner and fellow Army medic Gerald Montero while they were assigned to a small hospital in Baghdad, Iraq. Dirtbag also brewed beer at Railhouse before opening its own production site. Railhouse’s Ratkowski says Dirtbag is making one of the best Kölsch beers in the state. It’s on tap at super chef Ashley Christensen’s popular Beasley’s Chicken + Honey in Raleigh. Simmons-Valenzeula credits an unused gift for Dirtbag’s success. He and Montero returned to North Carolina after their deployment, buying houses next door to one another. He gave Montero and his bride a beer-making kit as a wedding gift, but a year later, it was still in the package.